The goth invasion of Southern California was subtle, carried out on low-wattage college radio and in the back pages of fanzines. It never became more than a subculture, but for those who were converted, bands like Joy Division and Bauhaus delivered much more than music. Goth, like its polar opposite surfer, became a type, a shared identity. Goth music provided a teenage existence that John Darnielle and Peter Hughes both experienced, long before they'd meet up and become bandmates. And on the Mountain Goats' new record, the band looks back at those misfit days, those bands, and how discovering all that dark music provided healing and escape. While it may seem odd at first for a band that's essentially been grouped as folk-rock deliver a paean to goth, the band has been steadily evolving away from its lo-fi beginnings, and in lyrics (and his two novels), Darnielle has always dealt well with dark subject matter. And while Darnielle writes the songs on Goths, as he always has, this time around it seems more than ever like he's speaking for the full band. "For me and John especially, we both grew up in southern California. That was one of the first things that we bonded over when we started hanging out, was this shared history of being into that music," Hughes says. "The idea of goth music having a foothold in Southern California seems very counterintuitive on the surface. When you're growing up surrounded by all that beach culture and you're also growing up as a misfit, there's that thing of hating all this, so you set yourself up oppositionally. "What can have more of the allure of the opposite, what can seem more exotic to a teenager growing up in suburban Southern California than the idea of crumbling post-industrial decay Manchester? The sun never shines and everything is covered in soot and everybody wears dark trench coats and that just seemed awesome." And while Darnielle has devoted songwriting efforts in the past to both his southern California adolescence (2005's Sunset Tree) and subcultures (2015's professional wrestling themed Beat the Champ), Goths felt different for the band from the start. "It felt pretty radically different, not like we sat down deliberately to do that, but it was more of an organic outgrowth of the way we've been moving musically," Hughes says. "But also there was the slightly arbitrary thing where John had written a bunch of songs for Rhodes piano. He'd gotten into a groove on this keyboard at home and he had all these songs that were keyboard songs." 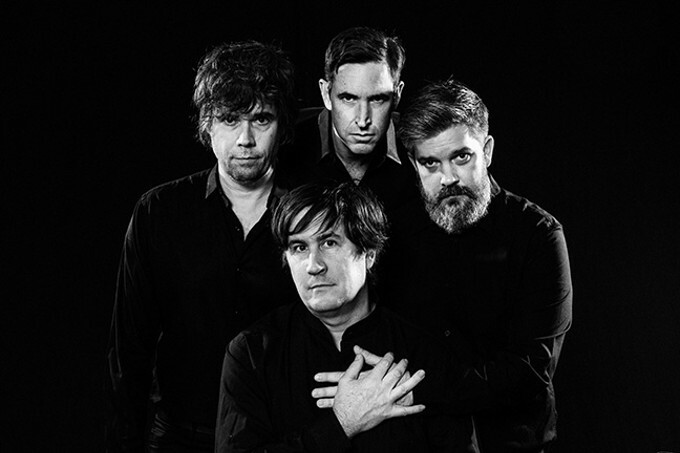 For the first time, the Mountain Goats recorded an album with a fourth official member. Initially a solo project for Darnielle, Hughes has been playing bass steadily since 2001. Superchunk's Jon Wurster joined on drums in 2007 and after touring with the band, multi-instrumentalist Matt Douglas is officially on board as the "woodwinds-and-kitchen-sink guy." To record, the Mountain Goats booked time in Nashville's Blackbird Studio (where the soundboard from Steely Dan's Aja resides). The sound was shaping up to be more subdued, a little mellower, a little more adult, Hughes says. "We get probably two thirds of the way through tracking and start thinking about what we can add, what other elements we can put on it, we're listening back and say 'What about a guitar? Have we even used a guitar on this album?' We'd realized we hadn't even picked up a guitar the whole time," Hughes says. "It was just this weird accident. It didn't occur to us until we were almost done that we hadn't used any guitar and at that point, we said, 'Let's just have a no-guitar album.'" The no-guitar status of Goths has become the album's calling card since its release in 2017, but Hughes says it wasn't a premeditated decision, just a happy accident. "That's cool. It makes it different compared to every previous album and it's a testament to John's songwriting and the singular nature of what he does as a singer and songwriter," Hughes says. "You can sit down and listen and not even realize that there are no guitars. The Mountain Goats are not dependent on a given instrument. It still comes across." Though it's a record heavily dependent on keyboards, the Mountain Goats had no intention of making Goths into a goth album. "The subject matter and the form are pretty different. There are definitely some nods to goth music sonically, but it's not a goth album," Hughes says. "We all share a similar sensibility and for any of us, the idea of taking a bunch of songs about goth music, goth culture, your personal relationship to this subculture over the years, it would be too on the nose to present it in a way that's aping whatever band." Surprisingly to Hughes, those bands that were so foreign and so hard to find ultimately found new audiences again and again over the years. Darnielle digs below the surface, writing about bands that have been forgotten, like Gene Loves Jezebel. Today's popularity of some bands would've been unimaginable back in the 1980s. "It's funny now, like with Joy Division, the iconography of the Unknown Pleasures art, that has become this ubiquitous signifier, almost like the Grateful Dead bears," Hughes says. "You can be watching some teen TV show and there's the poster of that on the wall. It's inconceivable to my 14-year-old self who discovered that stuff. At that time, it was so underground. The only way I found out about it was listening to college radio. It definitely was like a secret handshake." "One way you would connect with people was just in the back of fanzines, you put a little personal ad, saying 'Hey, looking for tape traders or pen-pals, here's what I'm into.' That's how I accumulated this stuff," Hughes says. "It really was this community of people dubbing cassettes, sending them through the mail, finding each other through the backs of magazines." How could an unknown artist hit No. 1 in a specific market, but nowhere else? Voting is Open for Best of Tucson 2019!